Atlantis' astronauts tenderly dropped the Hubble Space Telescope overboard Tuesday, sending the restored observatory off on a new voyage of discovery and saying good bye on behalf of the planet. Hubble - considered better than new following five days of repairs and upgrades - will never be seen up close by humans again. This was NASA's last service call. Over the course of five back-to-back spacewalks, the Atlantis astronauts equipped Hubble with a powerful new $132 million camera, a new $88 million spectrograph, six new stabilizing gyroscopes, six fresh batteries, a refurbished fine guidance sensor and a new science data computer, reports CBS News space adviser Bill Harwood. 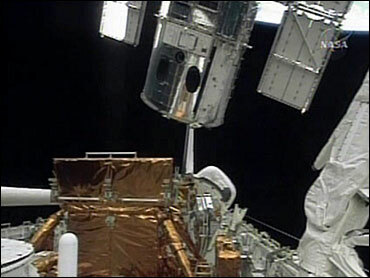 The astronauts also pulled off two unprecedented repairs, bringing another camera and an imaging spectrograph back to life after failures in 2004 and 2007. Hubble is now more scientifically powerful than at any point since launch in 1990 and with new gyros and batteries, it should remain operational for at least five more years and possibly more, reports Harwood. The shuttle and telescope had just crossed the Atlantic, and were soaring 350 miles above the coast of northwestern Africa, when astronaut Megan McArthur used a robot arm to release the snares gripping Hubble. Then the shuttle slowly backed away. "Hubble has been released," reported commander Scott Altman. "It's safely back on its journey of exploration as we begin steps to conclude ours. Looking back on this mission, it's been an incredible journey for us as well." Mission Control radioed congratulations: "It's wonderful to see Hubble, the most famous scientific instrument of all time, newly upgraded and ready for action thanks to you." With Hubble flying on its own again, the seven astronauts looked ahead to Friday's planned landing. But first they had to inspect their ship one last time to make sure it had not been smacked by space junk. The telescope's unusually high orbit had placed the shuttle and its crew at increased risk and, because of the lack of a refuge, prompted NASA to keep a rescue ship on standby until the end of the 11-day flight. The astronauts persevered through the mission, dealing with stuck bolts, ill-fitting gyroscopes and flyaway shreds of insulation. Two of them were ready to jump into spacewalking action one last time if the telescope's aperture door had not opened Tuesday morning or some other last-minute problem cropped up. None did. "This morning, you watch us from the pinnacle of human existence, representing the pinnacle of our craft, and leaving Hubble at the apex of its scientific power," Hubble program officials said in a message to the crew. "Hubble is now ready to resume its role as humankind's most powerful eyes on the universe." The Hubble team hopes to resume celestial observations by the end of summer, following an intensive series of tests. As for the space telescope's future, there will be no more visits. Sometime after 2020, NASA will send a robotic craft to steer it back into the atmosphere and a watery grave. The spacewalkers installed a docking ring for just that purpose. That day, however, was far from the astronauts' minds as they reflected on their success. "It's a little bittersweet that it's over," telescope repairman Michael Massimino said late Monday after the final spacewalk. "The big drama's coming," teased pilot Gregory Johnson. "Landing, baby."